After a brief hiatus, Star Wars Rebels is back with a level of anticipation that the show has never seen before. This is mostly due to the exciting mid-season trailer they released just a few days ago, which blew everyone's minds. Most of what we saw in the trailer appears to be scenes we'll see towards the end of the season, but there are moments in 'A Princess on Lothal' that tie in with some of the footage we saw in the trailer. Princess Leia made her spectacular debut this week, but it's Ezra that we should focus on first. Part of what makes Ezra so interesting is there's no indication of his larger role in the Star Wars universe. There have been theories about him being Rey's father, or even Supreme Leader Snoke himself. There's no denying that Ezra has a bit of the dark side in him, but what young Jedi doesn't have those impulses? The trailer seems to be pointing to a reality where Ezra will be tempted, and even perhaps trained by someone called 'The Old Master.' This is all speculation of course, but if Ezra's journey mimics Luke's in any way, there will be multiple times when the dark side will lure him in. This week's episode focuses on how Ezra is dealing with the realization that his parents are dead. The young man looks somber as one would expect, but in the end, he seems to take it in stride and decides that helping his comrades is more important. Leia's guidance helped in swaying him to focus on the task at hand, so there's still no way of knowing if his sudden desire to do the right thing is only temporary. Also, this being a Disney XD series, it's hard to tell how dark Dave Filoni and his creative team will go. So far, the writers have done a solid job at making this a kid friendly show that adults can also enjoy. There was some controversy concerning Julie Dolan's voice over work with Leia, saying that she sounded too mature for someone around 15 years of age. Sure, that's a valid point, but let's not forget that Carrie Fisher, who wasn't even 20 when she started filming A New Hope sounded very mature for her age. She even threw in a British accent when it suited her. In this humble reviewer's opinion, Dolan did a fine job. Leia was every bit the strong willed and stubborn princess we've come to know over the years. It was also great to see that the former prisoner Azadi (Clancy Brown) is going to be sticking around for the foreseeable future. The only worry is that this ensemble is getting a little too big for its own good, but Filoni and his team rarely let us down, so we should give them a chance. Star Wars Rebels stretches its creative wings a little more each week and if that fantastic trailer is any indication, we are in for an exciting ride. 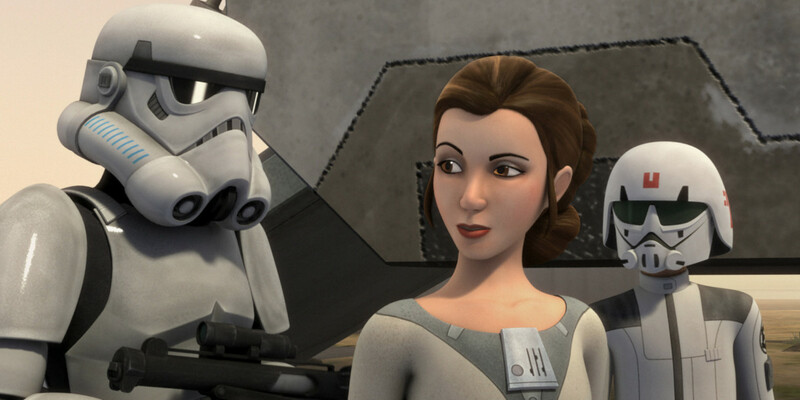 What did you think about Princess Leia's debut on Rebels?